Is there a need for people trained in pharmacy administration? The health care system, pharmaceutical industry, and pharmacy profession are looking for more people with advanced training who can conduct comparative effectiveness research, who understand medication safety and pharmacoepidemiology, who can develop market analyses for pharmaceuticals, and who can help advance the profession. The Department of Pharmacy Administration is training graduate students to be leaders in these areas. What are the benefits of studying pharmacy administration at The University of Mississippi? Does the Department offer scholarships and assistantships? Yes, the Department offers both research and teaching assistantships. Upon applying to the graduate program, you are automatically considered for an assistantship/stipend. Assistantships in the Department are usually $18,000-$20,000, are 12 month appointments, and include tuition waivers. Students on assistantship usually work 15-20 hours per week. 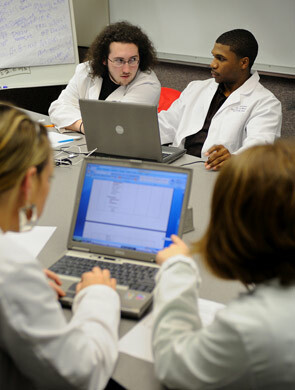 Teaching assistantships provide funding for students to assist faculty members with the professional pharmacy courses. Research assistantships provide students with various research experiences. They are often funded by faculty grants and contacts, the Center for Pharmaceutical Marketing and Management, the University of Mississippi Office of Research, and the Research Institute for Pharmaceutical Sciences. Various scholarships are available and students are encouraged to apply. Scholarships received are usually considered extra funds and do not take the place of stipend or assistantship funds. Examples of local scholarships include the Underrepresented Minority Fellowship Program, the Honors Fellowship, and the out-of-state tuition scholarship. How do students select thesis and dissertation directors? It is emphasized that each student, regardless of degree program, is urged to visit with each faculty member at the earliest convenient time after commencement of the student’s first semester and discuss areas of mutual research interest and possible collaboration or cooperation on research projects. Students are responsible for choosing an eligible faculty member to direct their thesis and dissertation. All Masters students must select a Thesis Director before the beginning of their third semester in the program. All Doctoral students must select a Dissertation Director before the end of their third year in the program. For students entering the program with a M.S., a Dissertation Director should be selected by the end of the second year of the program. Why should I study pharmacy administration at The University of Mississippi? The Department of Pharmacy Administration at The University of Mississippi provides outstanding graduate education in pharmaceutical marketing, management, and outcomes research. The faculty and students are collegial and enjoy collaborating to answer various scientific questions. Faculty help tailor the student experience to fit their needs and wants, based on their interests and career goals. We encourage students to get involved in various research projects with the Department and with the Center for Pharmaceutical Marketing and Management. We believe obtaining multiple research experiences while in school prepares students for their career. Does the Department support graduate student travel? Students are encouraged to present their work at regional and national meetings. The Department will support graduate student travel, pending availability of funds. Students working on funded grants and contracts with faculty members or the Center for Pharmaceutical Marketing and Management (CPMM) may be able to request funding from faculty members or CPMM to present findings from these projects at national meetings. The Graduate School also provides limited travel support for graduate students to present at regional and national meetings. Students in the Department have presented at various national meetings, including the American Pharmacists Association, ISPOR, Academy Health, and NCPA. Are there opportunities for students to complete internships? Yes, students are encouraged to seek internship opportunities during the summer. Recently students in the program have completed internships at AHRQ, BioVid Corporation, ToleRx Inc, Medical Marketing Economics, NovoNordisk, BiogenIdec and CE Outcomes. 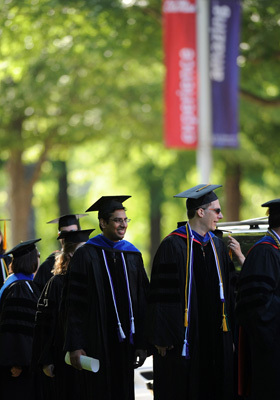 What resources are available to graduate students? Each Department graduate student is provided with adequate working space and materials to the extent that they are available. The Department in the past has been successful at ensuring that each graduate student has space, desk, computer/printer, and Microsoft Office software. Students are also provided additional software like SPSS or SAS as needed in the program. Graduate students have access to the School of Pharmacy library, the main campus library, and the Pharmacy Administration library in Faser 237. Students also have access to various research resources through the Center for Pharmaceutical Marketing and Management as described on their website. Students may have access to IMS data, Medicaid and Medicare data, and other databases for research. What is Oxford, MS like? The University of Mississippi is located in Oxford, a beautiful Southern town complete with oak-lined streets, a town square, and large antebellum and Victorian homes. 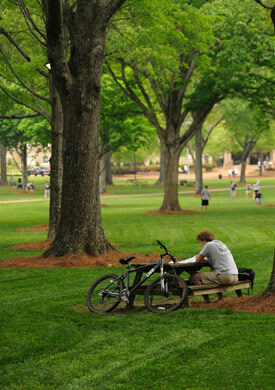 It is ranked as one of the top 100 safest Universities. This small town has a rich cultural heritage that offers many activities, including festivals, conferences, theater performances, and sporting events. Recently recognized as one of the best small towns in American by USA Today, Oxford is only an hour away from Memphis, Tennessee. The cost of living in Oxford is considered by residents to be reasonable by national standards. You can find out more about the town on the Oxford Home Page at http://www.oxfordms.net. What are the goals of the Department with respect to its graduate program?